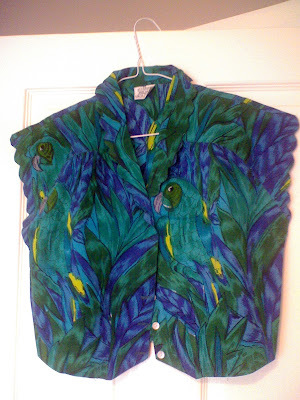 Thrift inspiration, Doing it Matthew Williamson Style!! On trend for this summer is 'tropical', which the Matthew Williamson for H&M range have highlighted for their summer collection. Birds and peacocks are very popular prints and are bang on trend for this season. Earlier in the season, I spotted this cute top in my local High Street ethnic store for only £1. Made in India, its a very tropical print and such a versatile piece too. I can wear it with the buttons done up as a blouse or open as a short sleeve jacket. The collar and sleeves have a lovely scalloped edging, so Chloe-esque!! Will you be in to the 'tropical' trend this summer? I don't wear many blouses, but I WOULD WEAR THAT ONE!! 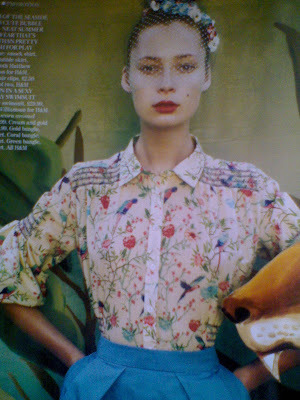 that is a gorgeous blouse Sharon, lovin gthe scalloped edges and of course the amazing print! perfect for summer,well done spotting it! My dear what a gorgeous top!!!!! And it was a fabulous inspiration. Have a fabulous as you are weekend. I think I need that blouse in my life. yep, I'm a sucker for tropical print! Actually I'm a sucker for anything colourful! Australia, meanwhile, has been bombarded by anything and everything peacock-inspired. Almost reaching overkill levels here. Loved the pics of your day trip to Paris...lucky girl! I just think peacock when I see it..and that's been popping up around here a good bit lately. Always love that tropical summer feel too. It seems the yellow can be over bearing sometimes, but I love the colors in this. OMG IT IS AMAZING! There is a parrot in the print! Wow! Hi everybody-thanks for all the fabulous comments, all much appreciated! Wow gorgeous colours in that top. I think I might go for tropical! 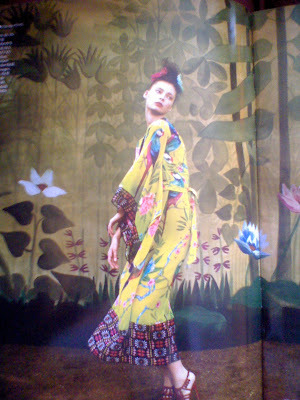 I will definitely be rocking the tropical peacock look this summer. I just got a fabulous peacock jumper from Free People (yeah, it wasn't cheap, but I rarely buy new clothes that aren't from thrift stores, etc., so I can justify it). Since I'm way too voluptous to rock a jumper that short, I'm having it converted into a blouse. I also have several tropical-themed shirts found at thrift stores over the years! Hi Bonnie-thanks a lot for stopping by and great to hear you are rocking this trend too! Oh my word, Sharon, can you score the blouse for me somehow? I'm a Uk 8 or 10....I must have it!! !